The Acura RDX is highly regarded and it is this brand's first compact crossover SUV. However, even though these types of cars are considered to be rather simple in design, the Acura RDX still inspires stylishness. In fact, it can be described as luxurious. The first generation of this model was launched in 2006. Since its debut it was very popular and a face-lifted version was then launched in 2010. The next generation of the Acura RDX was launched recently in 2012. 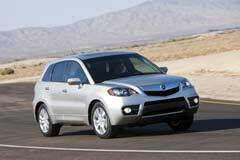 Buying a used Acura RDX is a good option if one wants space, solid handling and great performance on the road. This 5-door SUV has a 5-speed automatic transmission and is four-cylinder powered. It has a variable flow turbocharger. Besides a great exterior it also has various features which make its interior welcoming and comfortable. Leather seats, automatic climate control, satellite radio, a very good audio system and a navigation system are some of the things one will find in an Acura RDX. 2016 RDX Tech Pkg 2016 Acura RDX, Graphite Luster Metallic with 41406 Miles available now!